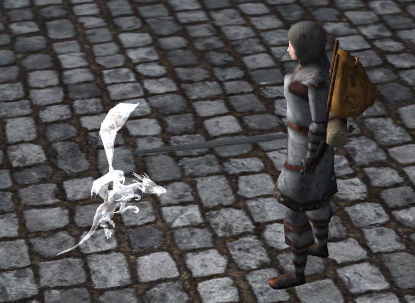 Non-combat pets are small companions that can follow you around, they do not fight (and will not be attacked by other creatures and players) and do not provide any bonuses… other than +10 to cuteness. To get a pet you need to find a “mystery egg”, and hatch it. Once hatched it will summon a random pet and give you a magic leash that you can use to summon and dismiss it in the future. Pets do not need a rope to lead them and will follow you relentlessly on their own once summoned. They don’t interfere with normal tamed/charmed/dominated/zombie pets so you can keep those while having a non-combat pet out. You can own multiple leashes at once, but only one pet can be summoned at any given time. Leashes can be traded to other players or sold on merchants. You can rename a leash to change the pet’s name, if it’s already summoned you will have to dismiss and resummon it for the change to show up. Pets are divided into 3 categories – common, rare and fantastic. For each category there is a matching egg rarity that will only give pets of that category. Common mystery eggs can be bought from traders for 5 silver. Rare and fantastic eggs can be found in treasure chests and monster lairs, and will have a chance to drop from unique monsters. They may also be rewarded from future events.